It’s no secret that identity theft and online financial scams have become a major problem not just across the United States, but on a global scale. 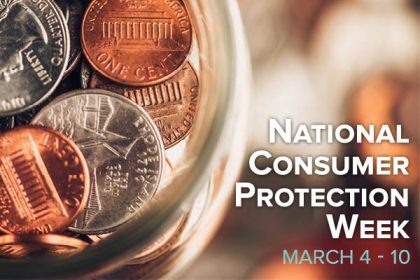 With National Consumer Protection WeekExternal link quickly approaching during the week of March 4-10, now is a great time to spread awareness about the presence of online scam attempts and identity theft threats. While there may not be any way to guarantee with 100% certainty that you will never be affected, there are plenty of ways to reduce your risk of falling victim to one of these scams. One of the biggest sources of identity theft for online hackers is that of the open, public Wi-Fi network (like the one you may log into for free at your local coffee shop). Unfortunately, these networks are 100% open, which means that any of the information you send over one of these networks has the potential to be seen by others. This includes not just login information (such as usernames and passwords), but credit card numbers, account numbers, and everything in between. You can drastically reduce your risk of falling victim by not using these open networks to log into your online-banking, pay bills, or share any sensitive personal information. Whenever possible, connect to a trusted, private network that requires a password to log into. In addition to using only trusted networks, you can also protect yourself from identity theft and scams by installing reputable anti-virus software and firewalls on your home computer, as well as checking websites to make sure they’re secure before making any online purchases. In most browsers, you can confirm this by looking to the left of the site URL; if a site is secure, it should say “secure” and have a small lock icon next to the web address for your peace of mind. It’s an easy trap to fall into. You receive an email from what looks like it is your PayPal account saying that someone tried to log in as you and you need to verify your information to protect yourself from someone hacking into your account. Your gut reaction is to click on the “Resolve this Issue” button conveniently located at the bottom of your email and log in to your account. The trick is, it isn’t actually PayPal, Amazon or your bank, but rather a scammer that is impersonating them. Often times you can tell by reading through the message. Are there misspellings, incorrect grammar or incorrect usage of verbiage? Not only do PayPal, Amazon and banks pay big bucks for proofers, but they will never send you an email requesting password, credit card or other personal information. There are also safeguards that you can put in place through sites like this that require dual authorization and a code is sent to your phone to verify that it is, in fact, you making the purchase. View PayPal tips on how to avoid a scamExternal link. Always remember, if it sounds too good to be true, it probably is. Above all else, keep a close eye on all your account activity, as well as your credit report, so you can be aware if any unauthorized purchases are made or accounts are opened in your name. At Union Bank, we want to empower you to protect yourself, which is why we offer resources such as ID theft protection through Deluxe Provent™. By enrolling in this option online, you’ll enjoy account monitoring services that will alert you if signs of identity theft or attempted identity theft are detected on your accounts. Protect It is another feature we offer on debit credits to protect your money. Customers can use our mobile banking app to suspend their debit card when not being used to prevent fraudulent transactions. When you’re ready to make a purchase, simply reactivate the card and make your purchase. After the transaction has been approved, you can quickly and easily suspend your card again through our mobile banking app. Contact your local branch for more information on how this feature works. We also offer prompt response for lost or stolen card reports; if you ever lose your ATM or debit card, we encourage you to visit a local branch during business hours or report your card lost/stolen online or by phone. This will allow us to stop any future purchases on your card and issue a new card as soon as possible. These are just a few tips and resources you can use to protect your good name from identity theft and online scams. Share this information and spread awareness to others!